Kadija B. of Spice Lime says, "You've never had shrimp and grits this good!" - and our tasters agreed. 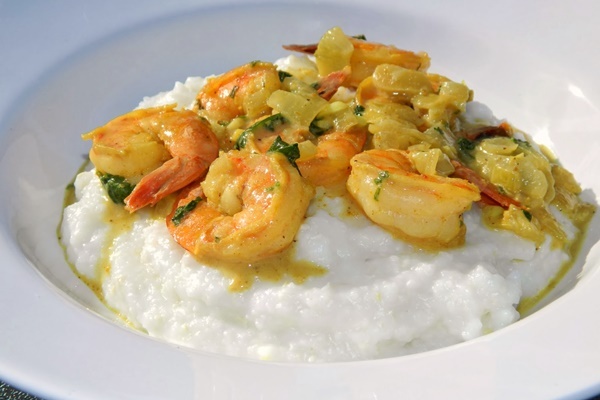 This flavorful Indian-inspired dish has a fun Southern flare, using coconut milk beverage in both the sauce and the grits! Combine the shrimp, lime juice, garlic, chives, salt and pepper in a large bowl. Mix well to evenly distribute the ingredients, cover, and place in the refrigerator for 20 minutes to marinate. Heat the oil in a large pan over medium heat. Add onion and sauté for 3 minutes. Add seasoned shrimp and curry powder. Sauté shrimp until pink on both sides, about 6 minutes. Stir in coconut milk beverage and brown sugar. Let simmer over medium-low heat for 10 minutes. Stir in cilantro and remove from heat. In a medium pot, combine the coconut milk beverage and water. Bring to a rapid boil over medium heat. Slowly stir in grits and salt. Reduce heat to low and cover. Let cook until thickened, about 15 minutes, stirring occasionally. Divide grits between 4 plates and spoon curry shrimp with sauce over top. Serve immediately.